﻿ Do You Really Know AAC Codec? Recently a piece of news stating that MP3 was officially dead and AAC had effectively superceded mp3 caused a stir among users. Don't worry, the news is not correct. What happened is simply the end of the MP3 patent-licensing program. By far, whether MP3 should be used in the future while remain to be seen, but the news indicates the inevitable rise of AAC codec. This article centers on the details of AAC audio codec: the audio quality, file size, streaming, applications, advantages and disadvantages of AAC vs MP3, AC3, FLAC. Also guide on AAC codec download and playback is shared. You will have a thorough understanding of codec AAC before you get it to your device. You can also check the explanation of AAC codec page on Wiki. People often think that AAC (Advanced Audio Compression) is Apple's proprietary codec, it's not. AAC codec is a lossy audio format developed and owned by a consortium of companies. The codec designed as the standard for high-quality digital audio superseding MP3. The codec AAC usually comes with higher-quality audio than an MP3 while at the same bitrate. AAC audio codec is available in many types: LC (low complexity), optimized for low-bitrate applications such as streaming audio; HE (high efficiency), designed to sound decent at very low bitrates, suitable for super-low bitrates (less than ~80kbps) or very small file size; m4p (Apple encrypted), popular in iTunes Music Store etc. AAC codec compatibility: AAC not only works well on iPhone, iPad and iPod models, unwrapped AAC (AAC not contained in the MP4 container) can also be played on a wide variety of non-Apple devices, including Microsoft, Nokia, BlackBerry, Sandisk (e200 line), Sony, PSP, Android-powered devices etc. Protected codec AAC: iTunes Store has been offering 256kpbs AAC files for a long time. AAC files purchased from iTunes can be authorized to play on a maximum of 5 computers at once. However, you can't play DRM AAC codec music on other non-Apple devices, or share with others. Information has been embedded into protected AAC music, which will easily track the user whole bought it once he shared it on peer-to-peer networks. 4) Backup and transfer AAC music, other media between iDevices and Mac. AAC has better quality and smaller size than MP3, but it can't compete with mp3 when it comes to compatibility. Currently, the mobiles and players compatible with AAC are still limited, and most of them support AAC-LC only. If you have trouble to play AAC audio codec, you may free download audio codec aac manually. 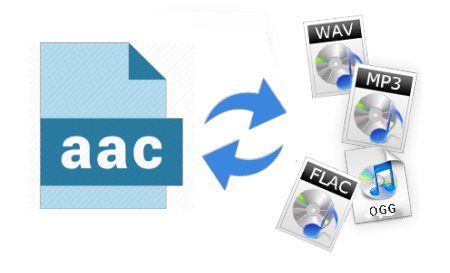 * MacX AAC Codec Converter - with AAC codec built-in, the AAC codec file converter helps to free download high-quality AAC codec-encoded music and audio from 1000+ online audio and music sites, and also convert video files from any formats into AAC codec, like encoding AVI, MKV, MPEG-4, H.264 to AAC codec with high audio quality. * Nero AAC Codec - a set of free software available for Windows and Linux to encode and decode AAC audio codec. It can handle high-quality LC and HE AAC codec and help convert audio files to MP4 file with a command line. * AAC ACM Codec - AAC ACM Codec is a good tool to play AAC streams. It can only decode AAC and won't encode AAC (if you need to encode files into AAC codec, you can choose Nero AAC Code). Having the AAC codec downloaded can help you listen to music from different sources compressed and encoded with AAC codec. Understanding pros & cons of the audio quality, file size, coding efficiency, streaming bandwidth etc of audio codec AAC will give you the better information and insight depth. MPEG-1 Advanced Audio Coding (AAC) has better compression efficiency than mp3 codec. For example, a 256kpbs aac sounds similar to a 320kpbs mp3 file. The enhanced coding efficiency achieved with AAC audio codec's higher frequency resolution, prediction, improved joint stereo coding and Huffman coding will reduce the audio file size. AAC codec generates better audio quality at equivalent bit rates compared with MP3, especially when the bit rates are extremely low (below 64kpbs). The enhanced block switching and temporal noise shaping (TNS) further help maintain high quality in case of difficult signals (e.g. old-time radio show files). Averagely, AAC audio codec has the same quality as Layer-3 at about 70 % of the bit-rate. The high coding efficiency not only results in small audio file size for a given bitrate, but also copes with limited bandwidth of internet streaming or mobile phone networks. Thus, AAC codec becomes quite useful for low bandwidth targets, like streaming audio to mobile phones or tablets where data usage is going to be charged. More and more music streaming services like Pandroa, Rhapsody, mSpot provide low-rate streams encoded with 64kpbs HE-AAC. Variable bitrate (SBR) is an encoding method which can increase or decrease audio bit-rate dynamically based on the sound. For example, birate will be dropped significantly for a section of silence in a song and increased (up to 320kpbs) for a part contains a mix of frequencies. This is called High Efficiency AAC (HE-AAC), which improves the coding efficiency by more than 30% and will therefore reduce the storage space needed. There is wide range of encoding options for AAC codec as it supports bit rates ranging below 64kpbs up to 320 Kbps, sampling rates from 8 kHz up to 96 KHz, audio channels from 1 up to 48, and different encoding quality levels. Though more and more recent devices are adding AAC as one of the supported formats, you will still have trouble on some players, especially on old devices. Even if the players claim that they support AAC codec, particularly for the portable devices, they support LC AAC only. Audio files in other AAC codecs like HE-AAC are not playable even if they are valid. During the AAC audio codec encoding with Winamp or QuickTime Player, high CPU usage is observed. Similar behavior also occurs during AAC decoding and buffering given that AAC use a more complicated method to compress the audio. The result is that your mobile can easily go out of battery during AAC music playback or streaming. Unlike MP3, which is now patent-free, AAC codec is still patent-encumbered. You don't need any license to stream or share files in AAC audio codec, but if all manufactureres or developers will need to pay for AAC codecs. This is not going to help with innovation or potential use of the audio codec aac. AAC comes in different flavors like AAC LC, AAC HE AAC PS, AAC Main etc. Besides, AAC codec can be encoded with extensions including 3gp, m4a, m4p, mp4, aac and etc. The combination of codecs and extensions makes it hard to determine whether the players or mobiles support the AAC streams. Below is a table on the comparison of aac codec vs mp3, ac3, ogg, AIFF etc to help you have a better understand of the codec. Conclusion: In summary, AAC can generate near-CD quality with good compress rates, which means that AAC audio codec will extend the running time of mobile devices by 50% when compared with mp3 codec. When it is at very low bitrates, AAC, as well as WMA, OGG will have better quality than MP3 codec. But if you prefer better compatibility, go for mp3 files. If quality comes first for you, the lossless formats FLAC, ALAC are suitable, while FLAC has better compatibility than ALAC, expect on Apple products. MacX MediaTrans will easily Unlock protection protection from iTunes AAC (.m4p) protected music, M4V movies, and convert them into DRM-free MP3 and MP4 for playback on non-Apple devices freely.It will also transfer and backup other media, including photos, movies, books, etc by drag and drop.